Understanding that fitness and well being are not one-dimensional, Lonna’s services are comprehensive. Karen Holtmeier, specialist from Weight Management Consultants, helps clients improve their eating and nutritional balance. Karen is a registered dietitian with over 20 years experience in nutritional and weight management counseling. 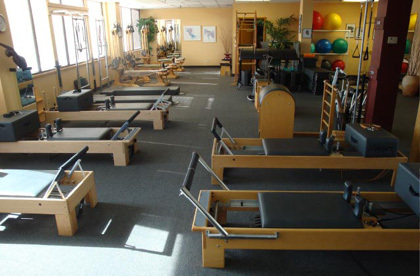 Lonna Mosow's Center for Mind Body Fitness features ALL of the apparatus designed by Joseph Pilates, plus the auxiliary pieces so significant to the work, from the Universal Reformer to the Foot Corrector. Location of accessory pieces, such as Physio-balls, Feldenkrais Rollers, etc. While equipment is available from several major manufacturers, Lonna often offers some of her equipment for sale. As equipment is updated or customized features desirable, equipment comes available for re-sale. Clients who want to work on their own at home between personal sessions or those coming from considerable distances and want the convenience of at-home workouts, will want to consider purchasing used equipment. Lonna’s Professional Fitness Services, another division within her organization, serves business and corporate clients. She customizes workshops and speeches for corporations, health clubs, chambers of commerce and business conferences. Lonna serves as an advisor to many Twin Cities’ corporations assisting in program design and implementation of Wellness programs. Some of her clients include: Honeywell, 3M, Seagate Technologies, Super Valu, and AT&T. A healthy workforce is a productive workforce. Classes can be held at any corporate site where there’s an empty cafeteria, meeting rooms, foyers or hallways.